Simple yet delicious Cilantro Mint Green Chutney is regarded as a quintessential element of all meals in Indian households. Any breakfast, lunch, snack or dinner spread is just incomplete without mint chutney. 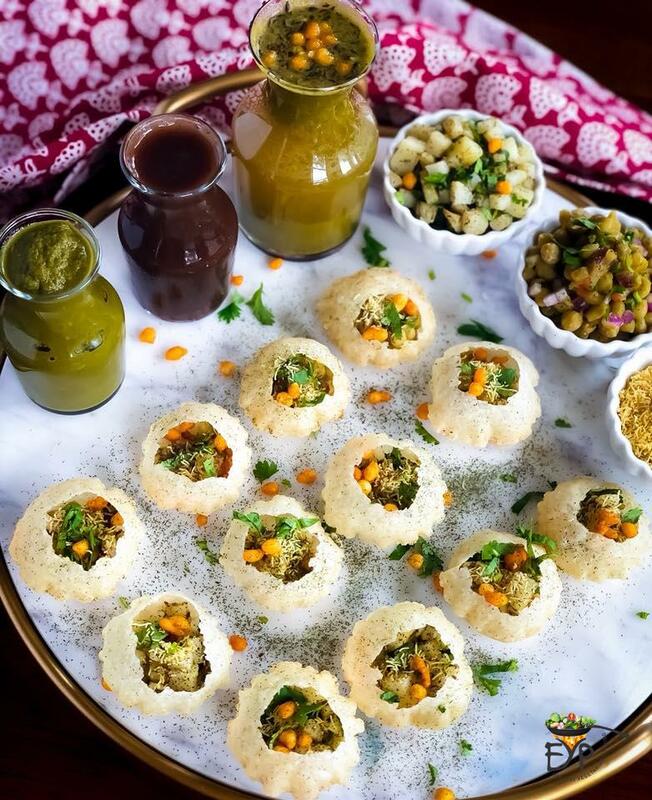 Most common and popular street food in India is Chaat, which can be made in many different ways and with many different components. However, one element that is common in all kinds of chaats is the cilantro chutney. 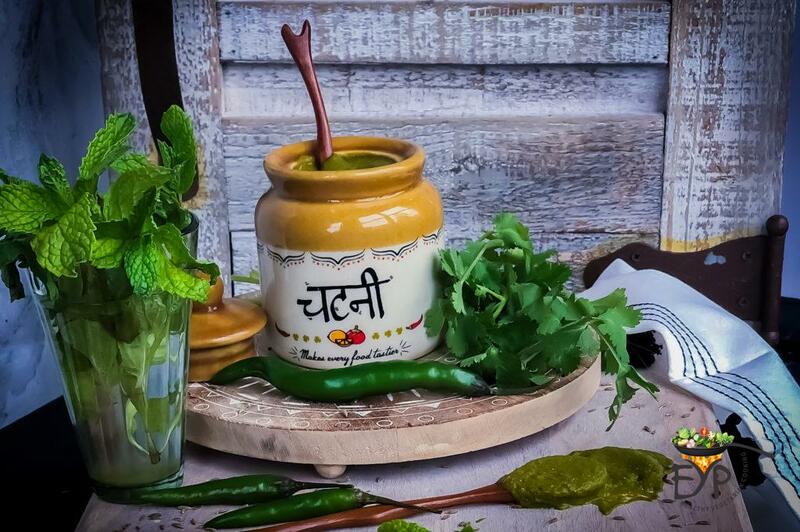 The word chutney/chatni comes from a word ‘CHATNA’ which means ‘to lick’. Mint chutney is supposed to be so delicious that one will end up licking it up with the help of finger. 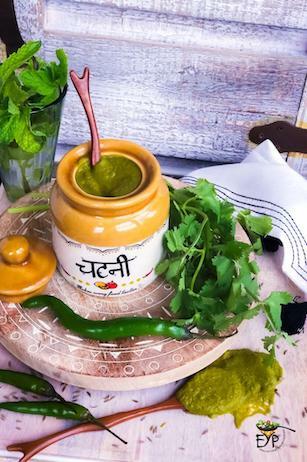 With respect to other cuisines, chutney is similar to a dip, which can also be use as marinade, as a spread or as an accompaniment to any finger food. Chutney’s can be raw, cooked or dry powder based. Most varieties of chutneies usually have a spice factor and acidic in nature. 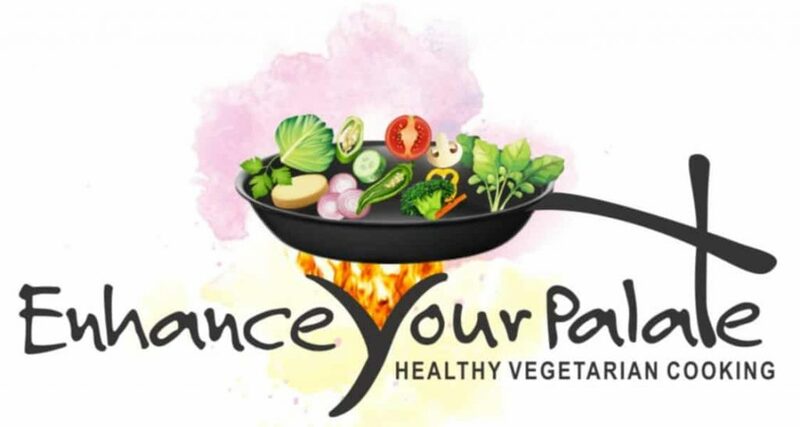 However, there are sweet chutneys recipes also. 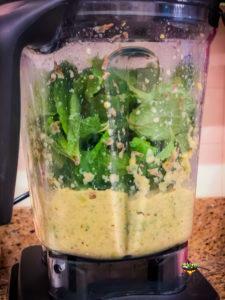 Cilantro mint green chutney is by far the most popular chutney. 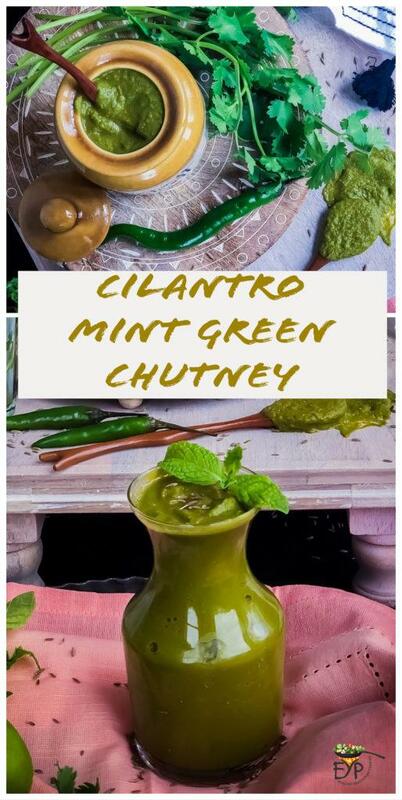 Hence, often when you hear the terms, mint chutney, green chutney, coriander chutney, cilantro chutney or Indian green chutney, they all are referring to the same recipe on Cilantro Mint Green Chutney presented here, which may be slightly different as per the individual’s choice. How is this Mint chutney recipe different from other recipes? 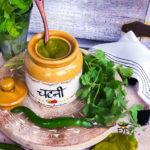 Mint chutney are quintessential to all Indian kitchens, yet every kitchen has its own variation of this green chutney. Some like it sourer, while some like it less tangy. Some like it spicier and some like it mild. Some recipes even add sugar or jaggery to cut down the spice level in it. You will find recipes both with and without onion/garlic. When served with tandoori appetizers, this chutney will likely have yogurt in it as well. 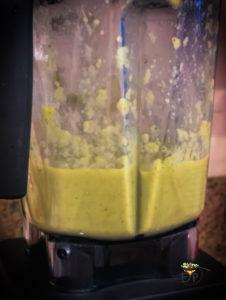 For me, when it comes to mint chutney, I can’t make it without green mango. If I am not able to find green mango, I would rather skip mint as well and make it without mint. 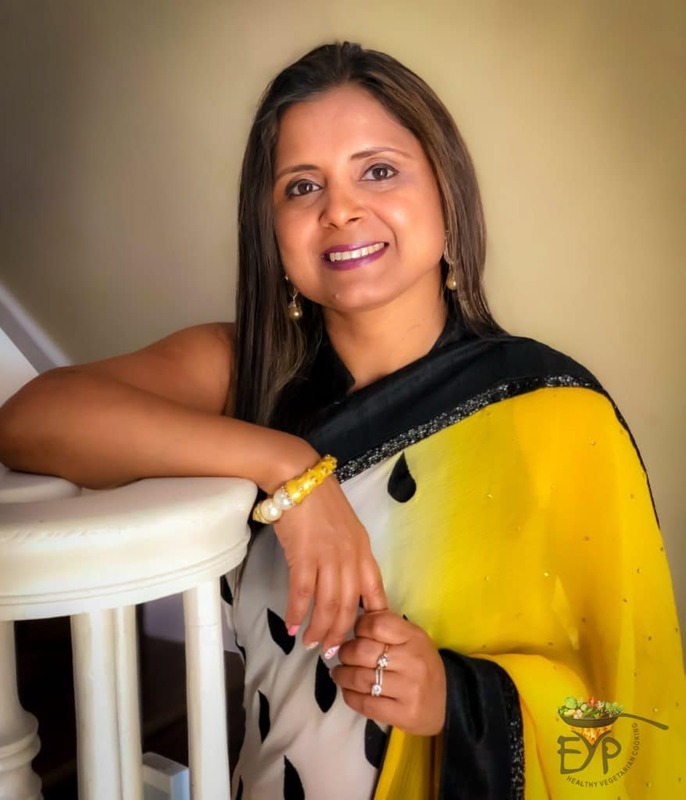 I, myself have many different variations of cilantro chutney depending upon my mood and what I am planning to cook over the course of next few days. Once, I did not have enough cilantro, so added curry leaves to add more volume in it and Voila! 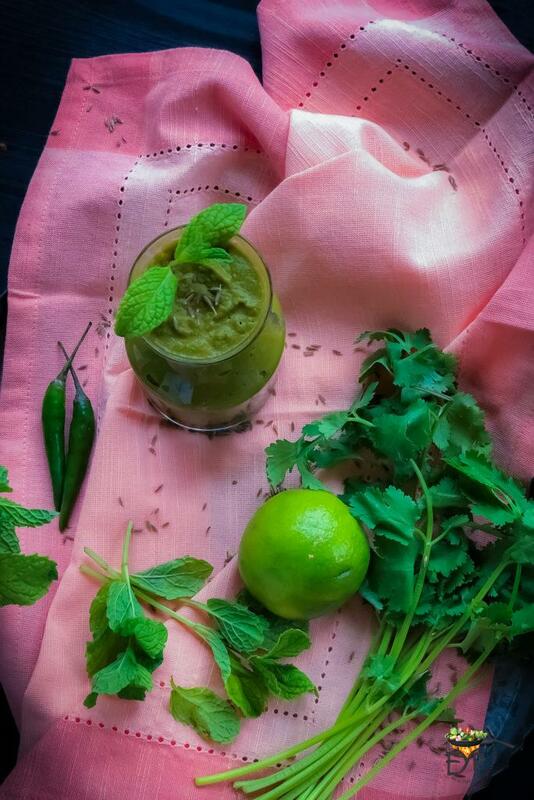 I invented another lip-smacking version of cilantro mint chutney. This version is what I have provided the recipe for. 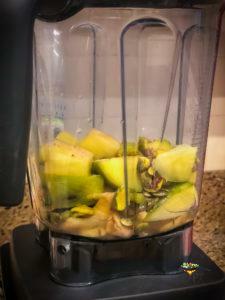 To increase the creaminess and further enhance nutritional value of chutney, I have added pistachios and pumpkin seeds. 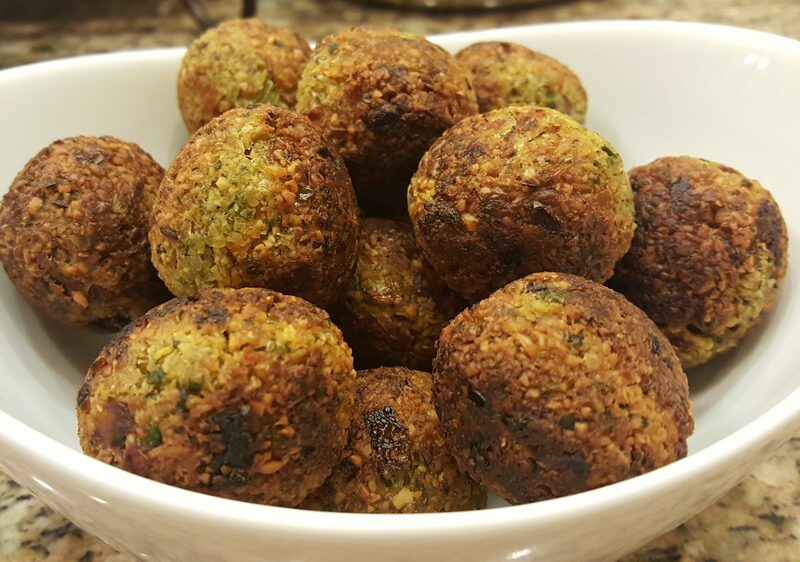 These are optional, you may instead add roasted peanuts or roasted dalia (split roasted chana). Some recipes also use bhujia sev (popular snack in India) as a stabalizer. Why it is a popular accompaniment? First answer is of course due to its lip-smacking taste, but did you also know about all its health benefits? 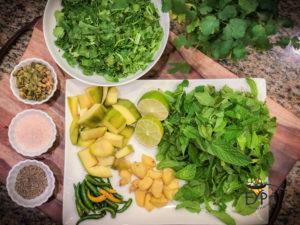 Some of the main components of this recipe are cilantro, mint, green mango, ginger, curry leaves and spices. 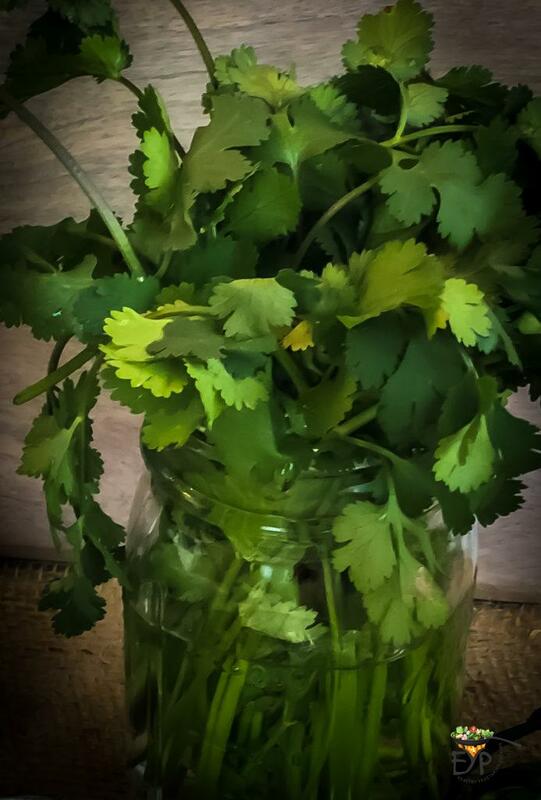 If you are a cook, you must have surely tossed Cilantro into your recipes for flavor and as garnishing. Other than the fact that green leaves look healthy, few people know that this everyday herb is loaded with fiber, iron and helps cleaning all heavy metals from the body. Cilantro, also known as coriander, is also capable of reducing inflammation, lowering cholesterol and balancing blood sugar. Mint has been used in medicines from ancient time, and a popular herb that has been used in toothpaste, gum, candy and tea etc. since it has one of the highest antioxidant capacities. 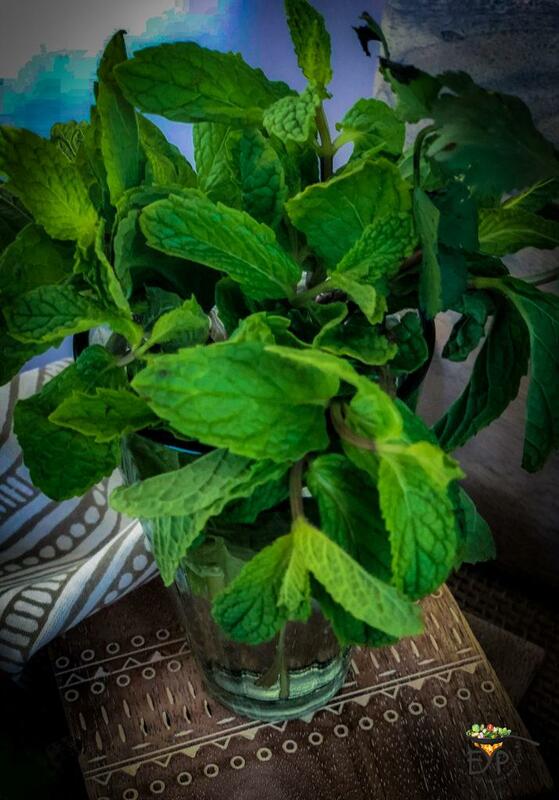 Mint is a popular aid for indigestion, upset stomach and gastric attack as well. Green mango, which has high levels of antioxidants, vitamin C and contains higher amount of digestive resistant starch or in other language probiotics which is important for optimal gut health. These antioxidant properties protect the body against cancer and cardiovascular diseases. Additionally, raw green mangoes also help in weight loss, treating indigestion/constipation and prevent dehydration. Green mangoes increase the secretion of bile acids and clean the intestines of bacterial infections that helps in treating liver disorders. Ginger has a very long history of use in various forms of traditional/alternative medicine. It has been used to help digestion, a powerful anti-inflammatory and antioxidant that make it effective in countering muscle pains, osteoarthritis and indigestion. I use it in almost all my recipes. Harde or harad is a herb native to North India, predominantly Himachal Pardesh. Using this herb ensures intestinal health that works great for constipation and weight loss. It’s a part of famous Triphala churan which is known for number of health benefits. 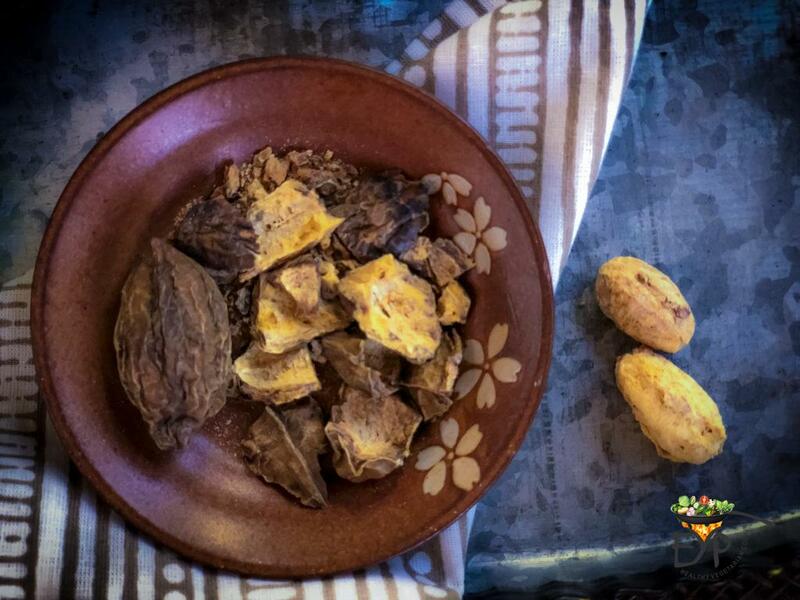 Harad also helps balance your doshas, clean out your stomach and improve digestion. It is also extremely beneficial for eyes. So now it does make sense to have as an accompanied to most of your meals…isn’t it? 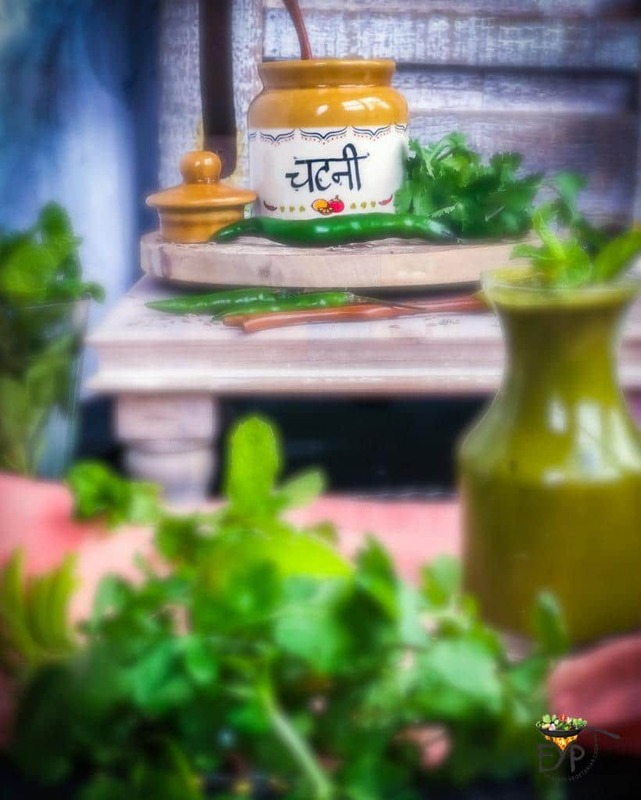 Making fresh mint chutney used to be a daily morning ritual in Indian households, however as lives are getting busier it is becoming more and more a task. In older days even my mom and grand mom used to make this chutney every day in the morning using sil-batta. Sil-batta is a kind of mortar and pestle used to grind the spices and leaves to make curry paste. As time have modernized, Blender took place of the sil-batta. Without refrigeration, mint chutney needs to be consumed the same day. When stored in an airtight container in refrigerator, you can store mint chutney for a few days. However, with the technique presented below you can make once in bulk and have it available up to 3 months. 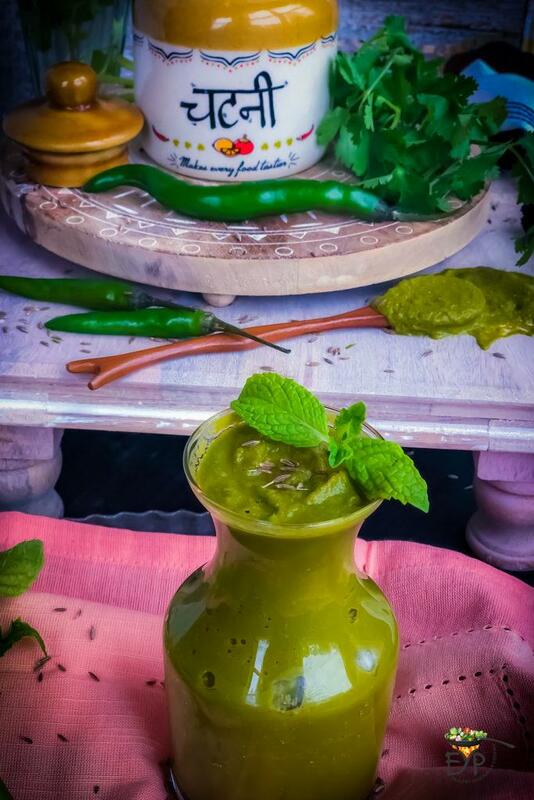 Mint chutney is freezer friendly recipe and can be freeze easily. Frozen chutney will keep its consistency and provide the same freshness and taste when thawed. Once thawed, you cannot freeze it again and you’ll need to consume it within a week. Hence, freezing in one container is not advisable as it will force you to thaw the whole chutney batch. 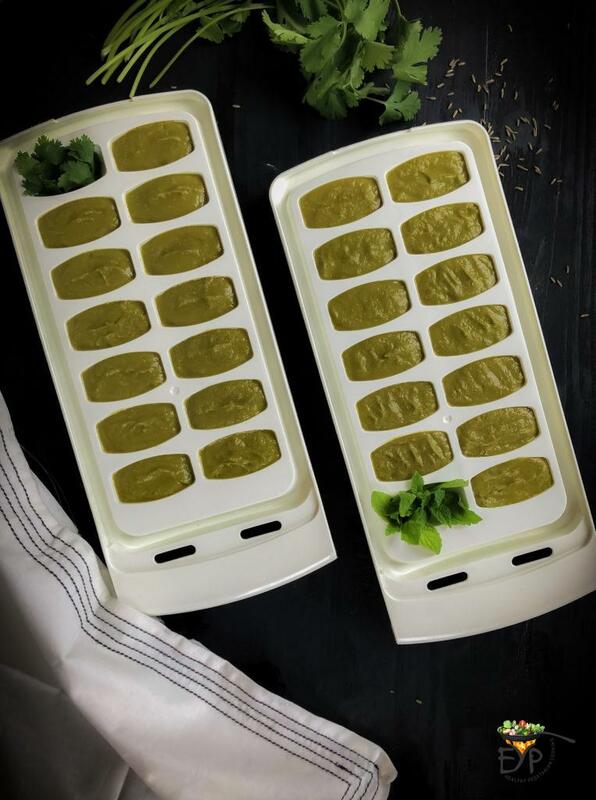 Freezing the individual meal portion size cubes using ice cube trays as shown below makes it easy to use and convenient to thaw at the same time. Once frozen, the chutney cubes pops out easily and then can be stored in a BPA free zip-lock bag in freezer. This way when in need just take out a cube and transfer it to a refrigerator section few hours before you need to thaw and you will be all set. Mint – leaves from 2 fresh bunches (100 grams). 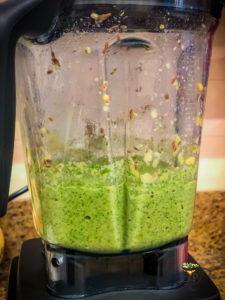 To make it easy for blender, roughly chops cilantro, green mango and ginger into reasonable size chunks. First blend green mango, green chilies, ginger, crushed harde, cumin seeds and astofitida in blender with¼ cup of water to facilitate the blending. Then gradually add all the mint leaves and blend. Then cilantro and again give a final blend. Enjoy the chutney with your favorite snacks or meal. 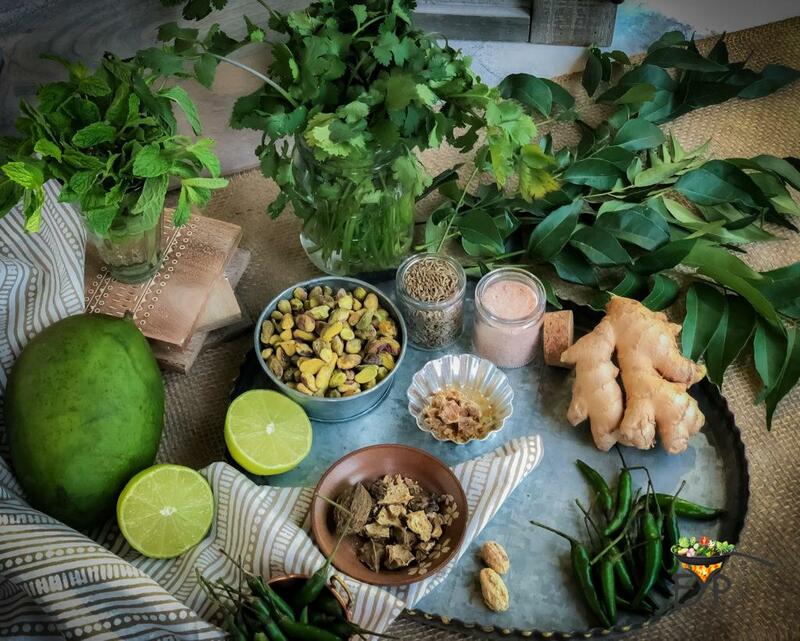 Cilantro Mint Green Chutney recipe enhanced with nuts, curry leaves and harad to make chutney creamy and more flavorful, which can be stored for extended period of time. 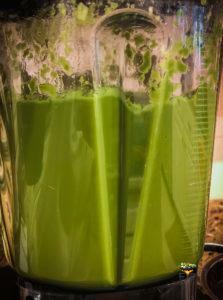 First blend green mango, green chilies, ginger, crushed herde, cumin seeds and astofitida in blender with ¼ cup of water to facilitate the blending. How did I not find your blog for so long. Will definitely be a follower from now.